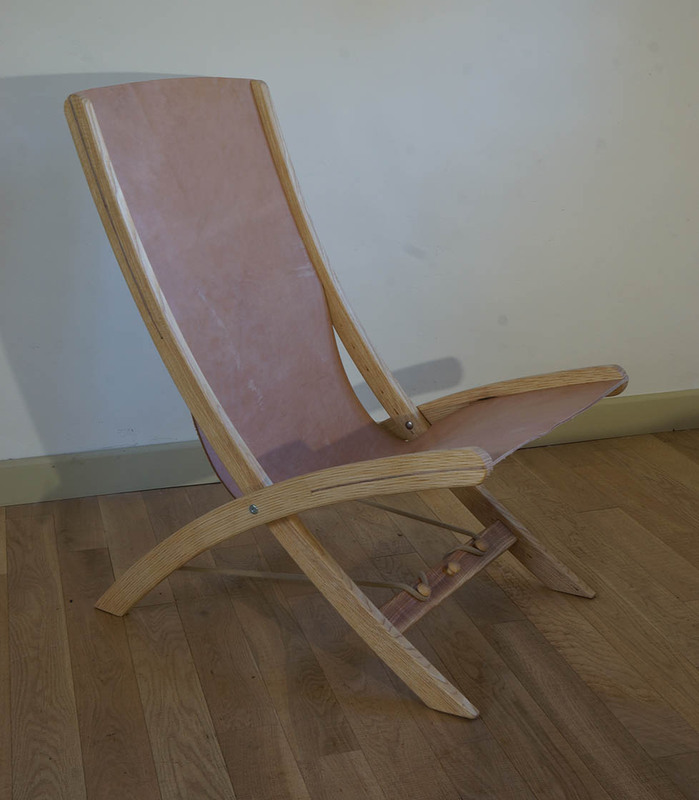 More than twenty years ago I made a leather deck chair. It was an experimental piece and not properly finished off. I altered it a bit to improve the comfort by cutting the leather and it sat in our sitting room as an extra chair. Rupert saw it and asked me to make him one. The local tannery had closed down so I went to Bristol to get more leather. We took our bicycles and rode up to the Clifton Bridge, round the dockland and back. I drew the chair life size on a sheet of plywood, cut a former and sawed the laminates from some ( not very) rippled ash and glued them together. I put the chair together over the next couple of weeks while fastening the wire mesh onto the roof in the afternoons. It was too cold and wet in the mornings, better in the workshop. I developed a cats cradle system for adjusting the rake. It surprised me with the comfort. Rupert liked it too and ordered another. Goody.